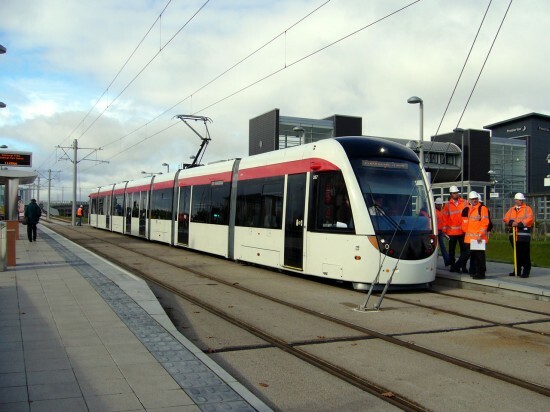 Tuesday 8th October saw, as planned, the first test run of a tram as far as Edinburgh Park on the Scottish capital’s tram system due to open in May next year. Tram 267 was the vehicle chosen to perform the honours and on its first slow speed journey was accompanied by numerous staff to check clearances on the route. We are grateful to John Hampton for providing us with the following images showing the first days testing. 267 emerges from the A8 underpass at the Gyle Shopping Centre in the first view. A large number of staff are on hand to make sure that everything is in order on this first test run. 267 is in the vicinity of the Edinburgh Park financial district as it makes it way through the grassed track area towards the Edinburgh Park stop. Superb photos, John; thank you very much. 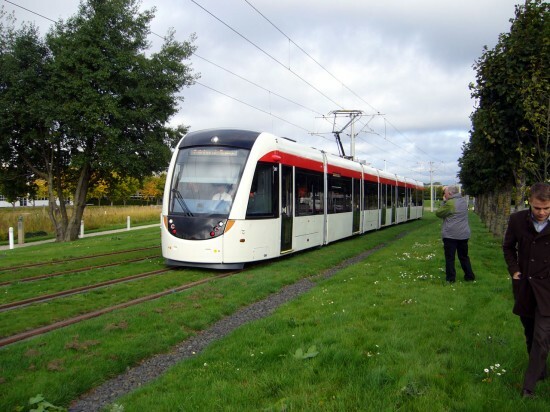 I am looking forward to riding the long-delayed tramway next September, when the LRTA holds its AGM in Edinburgh. After all the controversy, it is very good to see such progress. Many thanks to John for the photos. Took myself across to Gyle tram stop yesterday (Friday 11 October) to view tram driver training only to find system was down. Presumably, they haven’t quite got it “right” yet ?! 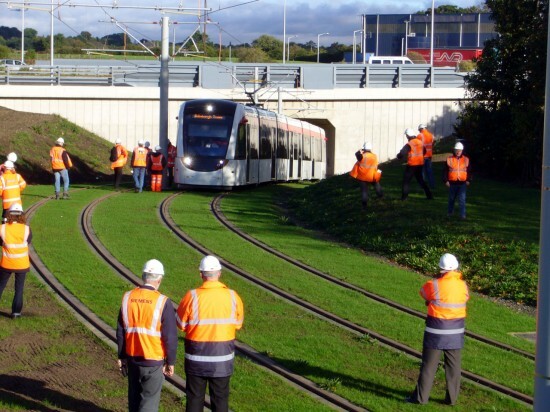 Today, 15 October 2013 Scottish newspapers report cracks were discovered by engineers in concrete track supports on a raised section at Edinburgh Parkduring last weeks test run.